Some basic properties and behaviors of liquid hydrogen are highlighted on this page. For more information on hydrogen properties, see Hydrogen Compared with Other Fuels. Hydrogen exists as a liquid at -423°F. Materials stored at this low temperature can cause cryogenic burns or lung damage, so personal protective equipment (PPE) is mandatory. Hydrogen undergoes a rapid phase change from liquid to gas, so ventilation and pressure relief devices are built into cryogenic hydrogen systems to ensure safety. The volume ratio of liquid to gas is 1:848. If you picture a gallon of liquid hydrogen, that same amount of hydrogen, existing as a gas, would, theoretically, occupy 848 gallon containers (without compression). 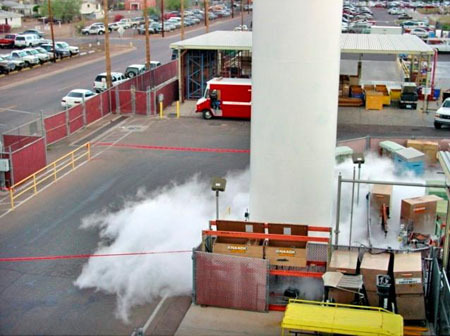 Even in dry climates, a liquid hydrogen spill will create a white cloud of condensed water vapor due to the cryogenic temperature affecting the humidity in the surrounding air. This low-temperature water vapor is heavier than air, so the cloud will remain localized and may move horizontally. As the hydrogen warms, it will dissipate and quickly rise. A liquid hydrogen release will look similar to this liquid nitrogen release. NASA White Sands Test Facility Hydrogen Plume Tests video (mov, 7.4 mb), filmed by ImageWorks for DOE.